If you’d like to support my efforts and donate you can click the button below. Today I should have been completing my 3rd Ironman Triathlon at Lake Placid. Alas it was not to be. Back in January I announced my grand plans to celebrate the 10 year anniversary since I lost my hand by climbing 19,341 feet to the top of Mount Kilimanjaro, climbing 1,576 stairs to the top of the Empire State Building and finally racing 140.6 miles to complete my 3rd Ironman triathlon at Lake Placid, NY. I did indeed climb to the top of Kilimanjaro in January (spectacular) and 4 days later climb the stairs to the top of the Empire State Building (lung burning). But, unfortunately I was not destined to race at Lake Placid. Five weeks ago I came of my bike whilst out on a training ride and shattered my collar bone. Painful, yes. Disappointing that I wouldn’t get to attempt my 3rd Ironman after all the months of hard training, you bet. What I didn’t immediately comprehend though was the loss of use of my right arm/hand…given that it’s the only one I have. Oh boy. The accident happened on June 18th in Haverstraw, NY. I was kind of run off the road by a white van that cut into my space after passing me, leaving me nothing but the curb and a few potholes to ride into. Being crouched over in my aero bars I came down hard on my right elbow and the impact shattered my right collarbone in multiple places. Whilst the driver of the van was oblivious and continued on I was fortunate there were others who stopped and in no time I was in an ambulance off to emergency…not that there was much they can do except x-ray my shoulder, to confirm the obvious, give me a sling and suggest I get an Uber the 40 miles back to Manhattan! With my plans in tatters all I could do was focus on the here and now and the immediate needs of my recovery. It’s funny how life happens. In going through this “adversity” it caused me to reflect on my journey ten years ago as I first overcame and then ultimately thrived after hitting those power lines. We all face adversity in life, for me it seems to manifest physically at times, yet there’s been plenty of emotional, psychological and even spiritual angst along the way. I believe how we face our challenges shapes us and can even define us. That’s certainly been the case in my life. Looking back, I see that in facing the biggest adversity of my life in 2006 it taught me how to not just overcome and survive, but how to push through and thrive. A system I have unconsciously used time and again since then. Step 1, I accept what is, without blame or anger or judgement or regret. No matter how bad the situation, if I’m still breathing then it could always have been worse. I found the best antidote to blame, anger, judgement and regret was gratitude. Step 2, I take responsibility and acknowledge the choices I made that lead to my current predicament, yet forgive myself and others that may have been involved. I find the key is staying in the present moment and not dwelling on the past and the inevitable “what ifs” and “if onlys”. Step 3, I let go. For some reason it seems that there is always something I need to let go of that is no longer serving me. Back in 2006 it was my hand, in 2016 it was my Ironman ambition. At other times it has been a part of my identity. Invariably I can’t move forward and thrive if I don’t first let go. I’d still love to raise $10,000 for the Challenged Athletes Foundation this year, whilst my Ironman didn’t work out I did at least get to complete a Half Ironman in May, a marathon in June and come November I’ll be racing in the New York City Marathon for the first time. This year marks the 10th anniversary of my rather calamitous paragliding accident resulting in the amputation of my left arm, mid-forearm. I’d predicted back then that in a decade I’d have a Luke Skywalker-like hand as a replacement. That didn’t quite happen, but we did get a new Star Wars movie instead. As I reflect back on my life over the last decade I can honestly say I haven’t missed my hand. What may appear to some as a physical challenge, a disability, I see as an opportunity. An opportunity to challenge myself and in so doing inspire others. I was fortunate back in 2006 to have the mental fortitude that helped me overcome and ultimately survive my ordeal. We all face adversity in life. We are all survivors in one way or another. Yet it seems that whilst most settle for surviving, others go beyond to thrive. How we choose to respond to adversity, big and small, shapes us and perhaps even defines us. Our goal therefore should be to not just overcome life’s challenges and merely survive, but to take each turn of events and thrive. Over the years I have shared through my blog a little of my adventures as I learnt how to thrive. This year, to mark my 10th anniversary as an amputee, I embark on my most ambitious challenge yet, climbing 19,341 feet to the top of Mount Kilimanjaro later this month. Followed by climbing 1,576 stairs to the top of the Empire State Building four days later (the day after my 45th birthday) and finally racing 140.6 miles to complete my 3rd Ironman triathlon this July at Lake Placid, NY. And to celebrate still being alive 10 years later I’d love to raise $10,000 for the Challenged Athletes Foundation who provide opportunities and support to those with physical challenges, children and adults alike, so they can pursue active lifestyles through physical fitness and competitive athletics. To put form to the myriad of thoughts that loop over and over in my mind. That, once on paper, actually turn out to be far less dramatic or important than they first appeared. It keeps me honest. It keeps me sane. Writing, not typing, but actually writing. Putting pen to paper and writing down each thought, slowing down the stream of consciousness, unravelling individual strands of thought and focusing the mind singularly on one at a time. Allowing my pen to capture each in its totality. And once on paper, freeing my mind. It’s hard to hold onto something that barely fills a page of my small notebook. Really, I’m angry, frustrated, upset or worried because of that? No. Instead I see it for what it is. And either let it go or choose to do something about it. Either way it no longer keeps me up at night or distracted during the day. A powerful thing indeed ‘tis taking pen to paper. There’s advice, the everyday words that you hear from others, that more often than not goes in one ear and out the other. And then there’s Advice. Words that weave themselves into the very fabric of your soul. That you write down, come back to, that become a principle or belief that shapes your life. Sometimes (perhaps often) that Advice comes from the strangest of places. There’s the usual sources of course, books, quotes from historical figures, friends, mentors, religious texts. All fine sources. Yet this piece of Advice came from none of them and is perhaps the most profound advice that I have ever heard. Advice that you can truly live your life by. Advice that I’ve written down often. That comes to mind immediately should anyone ask, “what’s the best advice you’ve ever received?”. Advice that seems so simple, yet is far from simplistic. All good Advice should be like that, don’t you think? Simple to understand, yet rarely simple to live by. I bet if I asked you right now, “what is the best advice you’ve ever received?”, you’d smile as it effortlessly popped into your mind. Well mine came from a movie. Not too strange you say? OK, it came from a movie that’s described by Wikipedia as a “pastiche-jukebox musical”. No, not the Disney kind, although Frozen’s “let it go” is some pretty good Advice to live by. No, it came from a Baz Luhrmann movie. A movie he wrote, directed and produced. A movie I absolutely love for all of its flamboyance and spectacle. This is the movie that I’ve watched more than any other, that I’ve purchased and repurchased from DVD to Blu Ray to digital streaming. The movie I love to watch with the volume cranked high on a huge screen. As good now as it was when it was released in 2001 (admittedly it did get nominated for 8 Oscars). Thank you Moulin Rouge, thank you Baz Luhrmann and thank you Ewan McGregor who spoke these words in the movie. Advice from a strange place indeed. What better way to take in the sights and sounds of New York City then a trip on the Hudson River, a ride along the West Highway and a walk in the park, Central Park that is. And that’s exactly the draw for some five thousand triathletes from around the world who travel to New York City each year for the iconic New York City Triathlon. What better way to take in the sights and sounds of New York City than swimming a mile in the Hudson River, yes it’s quite safe, biking twenty five miles along the West Highway and running the six miles along 72nd street and into and around Central Park. It all started 4:30am on Sunday, July 19th 2015 at the 79th Street Boat Basin Marina, not a place many would think to visit, yet there’s a cute little cafe overlooking the river and boats right there. Admittedly it’s dark at this time in the morning, thankfully dry and bustling with athletes setting up their bikes in the transition areas. Two are needed to accommodate a field this large. People of all shapes and sizes in various stages of disrobement. We each get two feet of space between two other athletes, one on either side, to hang our bikes and lay out towels, bike shoes and helmet, run shoes and if they’re a paratriathlete like me, a prosthetic leg or two, an arm maybe, a wheelchair, hand cycle or tandem bike for those that are blind. This particular race attracts quite a crowd of physically challenged athletes who also want to experience New York City from this quite unique perspective. All the hustle and bustle of Times Square concentrated along a mile stretch of the Hudson River, bright lights and all. For most people, diving into the Hudson River is not something that’s on their bucket list, but then they just won’t get to experience all New York City has to offer! The race begins at 6am with the pros completing the 0.93 mile swim in just under 12 minutes, meanwhile the last athlete doesn’t enter the water until closer to 8am, at which point the pros have already started to cross the finish line in Central Park. The paratriathlete wave heads off at 7am, the swim takes me 25 minutes this year compared to 18 minutes last year. I’ll blame the current, just wasn’t as strong this year…that’s my excuse and I’m sticking with it. Then cycling along the West Highway, heading North, without a car in sight (one side of the highway is closed to traffic), is the only time you get to ride in the city without the fear of being hit by an errant car…see what an opportunity you are missing. For most the bike takes an hour and a quarter to two hours. Thankfully due to recent resurfacing work it’s no longer the bone shaking, nerve jangling ride it used to be. Those athletes that take the time to look around are treated with vistas of the Hudson River on one side and city skyline on the other as they ride from 79th Street up to and into Van Cortlandt Park to turn around and head back. Spectator cheers and cowbells fill the air as you return to the transition at 79th Street. An hour and nineteen minutes, a whole minute faster than last year and with an additional minute saved on transition that’s only 5 minutes to make up on the run. Six miles along a closed off 72nd street and into and around Central Park. The prayer for cool temperatures hadn’t paid off and legs begin tire as the heat builds. I’m still the first paratriathlete in the field, I have an official on a bike riding beside me radioing in my position…maybe I’ll get to break the tape at the finish line! Alas at mile five Omar Bermejo surges past me, also an upper limb amputee, yet with legs a good ten years younger than mine. The official on his bike continues on without me. The park is all trees and rolling roads and on a hot day it’s a game of dodge to stay in the shade as every uphill saps whatever strength is left. The crowd’s energy infuses the athletes as hot, sweaty, exhausted, yet exhilarated we sprint the final yards across the finish line and our own personal victory. The run took nearly 55 minutes, 5 minutes slower than last year for an overall time of 2 hours, 47 minutes. Should have trained harder. The ironic part, as is often the case with triathlons, for me it was won and lost on the transitions. Omar, who passed me on mile 5 of the run spent only three minutes in T1 versus my six. What I’d have given for an extra three minute lead on that last mile of the run. Still I placed 5th overall for male paratriathletes when all was said and done with the scoring system that levels out the different disabilities. A podium finish and cash purse thanks to Accenture. With each step from good to great, it starts to take a perceivably greater amount of effort (and time). And this is where most stop. The increase in level of mastery becomes almost imperceptible, even though we seem to be applying the same amount of effort as we had done in the past. Frustration sets in and suddenly it’s time to find something new to master. For those few that stick with it, over time, and with ever-increasing levels of effort, they can go from good to great. And fewer still, from great to outstanding. 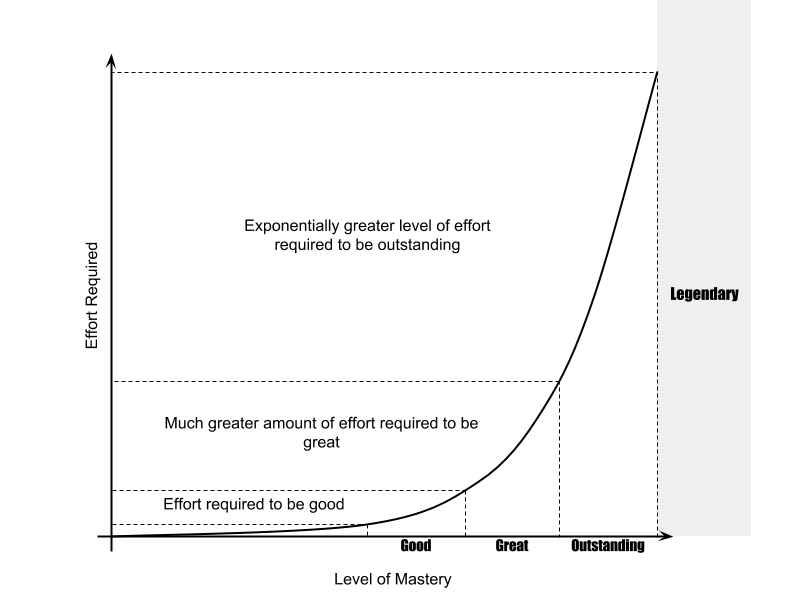 Yet, the interesting thing is, that to go from outstanding to being truly legendary is nigh on impossible if you simply try to apply greater levels of effort. There’s just not enough hours in the day or years in a lifetime. No, sometimes the way forward is less about doing and more about being…now there’s a thought. It’s early morning, dark, with just a pin prick of light illuminating the room. I focus my gaze on the flickering candle in front of me; sitting, staring. Sleepy still from the night’s slumber my eyes relax, lose focus. One candle becomes two and the dance begins as candles move to and fro. Both quite real, floating in front of me before my very eyes the illusion of separateness. My focus sharpens and what was two becomes one and I see the Truth. There is only one candle and they are both me. Cogito ergo sum. It’s interesting how we self identify so with our thoughts. It’s as if “I think, therefore I am” was a Truth. Yet, what I think is no more who I am than what I see or hear. We don’t self identify with what we see and hear and yet we do with what we think? In the same way that our autonomic nervous system triggers a flight or fight response based on what we sense, without conscious evaluation, it seems as if at times we are hardwired to react to our thoughts and emotions without conscious evaluation also. As if my thoughts and emotions are who I am – except they are not (the delusion of the ego). I am – comes first; and therefore I think; and I feel; and I see; and I hear. Our ego exists within the realm of our thoughts and emotions. But who we are comes from a deeper place. A self that transcends and enfolds our ego mind (small mind). To evolve beyond reactionary responses and feelings we have to first understand that how we feel or act is a choice. That our thoughts and emotions are simply sensory inputs to be evaluated. I am angry. You made me angry! Really you are anger? That’s who you are? No, you are not anger. And no-one can make you angry. You have chosen to feel anger and act accordingly. Consciously or not. With practice we are able to slow down, wake up and become aware of these choicepoints. After all, the choices we make dictate the life we lead.